→How do you make money on twitter ? Twitter can only be used as a market place and the key lies in the number of followers you get. Don’t be fooled though. Your followers have to be natural and targeted. Having natural followers is tantamount to having real customers on a local market site. That’s just it. The more customers you have, the more you can sell from your store. So how much money you make on Twitter depends first on the number and quality of followers you have and secondly, your monetizing models. Back to question! Build your marketplace first! Your followers constitute your marketplace. You have to get as many followers as possible and this must be natural. 1 – Get a real Twitter account. Use proper description and a reachable URL. I recommend uploading a real picture and to an extent, you may want to customize your profile background image. 2 – Tweet reasonably. Don’t tweet like a bot. Tweeting below 10 times a day looks reasonable. Don’t spam your timeline with promotional tweets. Don’t tweet everything you come across. Tweet relevant and targeted materials. 3 – Send out tweets/posts encouraging people to follow you. This is under-looked but I think it’s a useful method. Encourage friends and readers to follow you for updates and useful information. 4 – Do you have a blog ? If you do have a blog, it’s a result driven method to let your readers know about your Twitter account. Make it easy to find you by link to it from your blog. There are a couple of other ways you can naturally grow your Twitter base. – > Real Followers or Bots ? Let me share some of the things you may not want to do. Some of these may help you get followers but watch out – are they real followers or bots? 1 – Don’t buy followers. I really advice against buying followers. Most of these followers are fake. Thy are simply going to swell your follower base with no value added to it. 2 – Bribing people to follow. If you offer some sort of incentives for people to follow you, they may end up not paying attention to your tweets or just unfollow you. If they followed to download a thing or to earn some sort of credits or points, there is no guarantee they will be loyal. What do you think about this? Are you on Twiends, JustRetweet or EasyRetweet? These systems offer incentives to follow. You may call this ‘grey-hat’ following. The same principle applies to contests or sweepstakes where participants follow an account to enter. Some may immediately leave after the even is over. Use #harshtags reasonably on keywords. Don’t promote affiliate products that are irrelevant. Don’t spam with affiliate links. Don’t sound like a bot. This is another way to make quick cash on Twitter. You get paid by advertisers to post their messages to your Twitter account. The more your followers, the more advertisers you attract. But the question that comes up here is where to get advertisers. There are a couple of platforms you can join for free to list your Twitter account and make money. Some of these platforms expose your account to advertisers who pay a whole sum per tweet. Others pay per click your account generates. This is one of the platforms to get paid per click. If you have real followers, the fact is that you get clicks on links in your tweets. Tweeting targeted content to your account with a considerable number of natural followers will generate a reasonable amount of income. Create a free account on Mylikes here. On this platform, there are always hundreds of paid tweets in different categories. Choosing the posts most appropriate for your audience maximizes your revenue. The more money you make on MyLikes, you make even more money. They run a daily contest where the user who earns the most in a day gets a $100 bonus for being the top earner. At the moment of writing this post, the top earner on the leader board has made $29.98 already. If the contest was to be concluded at this level, this user will be banking $129.98 today. Is that handsome per day? 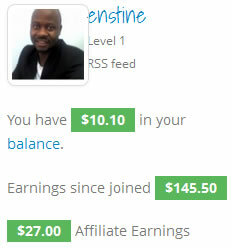 This platform also has an affiliate program where they pay you a fraction of what they earn from your referrals. There are a couple of other platforms out there. You may go ahead and start with these I recommend. You are sure to make money and get your earnings paid. However, you have to read their terms so you don’t get on their toes and have your account banned and income withheld. Are you making money on Twitter? Are there other platforms you can recommend? Please share your thoughts and leave a comment in the comment box. Give me a lift! Share this post on social media. Titter is a powerful tool and it’s wise to leverage on it. Addynamo.com sponsored tweets is also cool. I use it. Made $30 in the last two weeks. Great and informative post!!! I also have an active twitter account. But, i didn’t think about make money through it 🙂 But, you give me the idea now. I’m going to give a try to mylikes and sponsoredtweets. I’m already a member of Justretweet and easyretweet. But, twiends is really new name for me. other two give me so many retweets and followers. It really works good. Will join twiends soon. Thanks for sharing it with us. Best wishes for your new blog. please tell me , mylikes.com is showing URL country . whats that means. Not heard of mylikes before but seems promising. Should I register with them as publishers and get paid for including links on the tweets, if I am correct? Register as publisher and you’ll a list of posts to send to your profile and be paid per click. That’s quite straight forward. Hi Enstine, You probably remember I really like Sponsored Tweets. I’ve done pretty well with them since going Pro. Because of this post I just changed some of my settings there – thanks for the reminder 🙂 I think I had explored MyLikes but will check it out again as Twitter is my fav place. I so agree you must have a photo and not buy followers. If you have a lot of followers you can tweet more than 10x per day with no problem. I found if you tweeted a lot and lost followers it was time to tone it down. It also depends on the niche as well. Thanks for the inspriration to try more out Enstine and have a great weekend. I went pro and downgraded because I saw no real value. Good to know it’s working for you. I may have to reconsider that option in the future anyways. The detailed description about the topic shows the in-depth analysis you’ve done to accumulate the knowledge. I was not even knowing you can earn money via Twitter too. Good to know this post was helpful. Try some of the tips and i’m sure you’ll start generating income. getting paid to tweet is an easy and great way to make money, but to make a good income of it; you need to have a high following base and very engaging followers. The more followers you have and the more engaging they are the more likely you will get paid higher. Thanks for sharing. Hey Enstine! Great tips my friend! I have had a Twitter account now for a few years but never really even looked at it.Surprising I had any followers but I did. anyways a few months ago I joined a Mastermind Group and learned that Twitter is where I needed to be spending more time. And as a result I have been building natural followers as you say and have been making some great connections. Sounds awesome Chery that you have been growing naturally. It may be taking some time but the value in it is worth the time. Any attempt to monetize it will be very positive. Very good article, Enstine. You have shown that it’s not EmFastIncome blog that made you, but you made it, and you will make this EnstineMuki blog even greater! Well done! I and lots of others look forward to more awesomeness from you in the coming days. As you asked us to share this on social media, I have shared this on the #1 Internet marketing social bookmarking and networking website, Kingged.com and I “kingged” it. Very detailed tips, Enstine. Which is very nice because so many articles are made these days about how to make money online using Twitter but haven’t really gave any benefits because the shared tips aren’t actionable. So this is a fresh and helpful take on the subject. And I’ve noticed, you really did push through with your plan on changing your domain name. Cool! Found this post, as usual, being shared on Kingged.com, and left this comment there as well. Great tips. Making money is very possible with all the ideas you suggest in write-up. You can service on fiverr, seoclerks, and other micro-job sites. You become website or Ad copy promoter on twitter, on fiverr i have seen seller s making six figures from this tweeting service. Yes, Tweeter is definitely can aid you to with regards to monetizing and also with for the idea of using SponsoredTweets and Mylikes, a platform that can generate people to make money. I found and I “kingged” this on the Internet marketing social site – Kingged.com and left a comment. Really an awesome article!I am an active twitter user since long but didn’t think about making money through it. I’m going to try mylikes and sponsoredtweets. I’m already a member of Justretweet and easyretweet. But, let me try twiends. Enstine Muki recently posted…4 Ways To Fake And Succeed Online! An impressive and interesting information about Twitter, and nowadays social media one of the best way to leading own websites of the top of Google and Twitter is comparatively better to another social media websites, thanks for shared that how to earn money and get traffic from Twitter.